This is Part 4 of the “Cleaning Up the ‘Chan v. Ellis’ Mess” commentary series. If you have not read Parts 1, 2, and 3, you should do that first and then come back here. Everything will make more sense to you. Linda and her lawyer, Elizabeth W. (Betsy) McBride through their irresponsible choices and actions wasted many people’s time, energy, and resources over all this. Although a lot of unintended benefits and priceless relationships were formed along the way through this two-year ordeal, none of this had to happen. Hindsight is often 20/20. I cannot say for certain that even with all the knowledge and experience I gained in the last two years, that if I had a chance to go back and redo the February 2013 hearing all again, that I could have prevailed. I think my chances would have improved significantly with what I know today but, perhaps, there was never really any way out of this for me except by going through it. An important point I want to make is that I have never regretted representing myself at the February 2013 hearing. I would have done a number of things differently but reading over the transcript, I did the best I could with what I had. My lawyer, Oscar Michelen, did an excellent job prepping me via Skype and it was extremely helpful. However, what I desperately needed and regretted from that day was an extra pair of hands to help with the props, exhibits, refreshments, lunch, paperwork, exhibits, etc. There is a famous saying in legal circles, “A man who is his own lawyer has a fool for a client.” And yet, I am the “fool” who still does not regret representing myself “pro se” at the February 2013 hearing. There is no one who knows ELI better than me. There is no one who would have fought as hard as I did to get the many important points into the court record as I did. There is no one who would have prepared as much as I did. Quite simply, no Columbus lawyer I knew could handle the depths and complexity of ELI and didn’t have the inner fire I did. Both Oscar Michelen and Bill McKenney told me more than once that I did a very good job for a “pro se” defendant in laying the groundwork for a successful appeal. It was high praise coming from both men. Bill McKenney has mentioned to me more than once that I should consider becoming a lawyer. I chuckled at the idea and just took it as the compliment it was meant to be. There are parts of the transcript I cringe to read but overall, I was satisfied with my performance given the circumstances and my relative inexperience in arguing in a trial. Some might say it is easy for me to say NOW that I have no regrets in representing myself because of our unanimous legal victory. But the truth is that I have maintained that “no regrets” position in representing myself the last two years. Even if I had not achieved a full win, none on our team could fully accept that we could ENTIRELY lose given the many layers of defense arguments we had including the First Amendment and Section 230 of the CDA. We believe we submitted very good legal briefs and Linda’s team had a very tough fight to keep the permanent protective order in any form much less keeping it entirely intact. Linda Ellis seems to like tell the story of how I allegedly called her “employee’s” girlfriend. 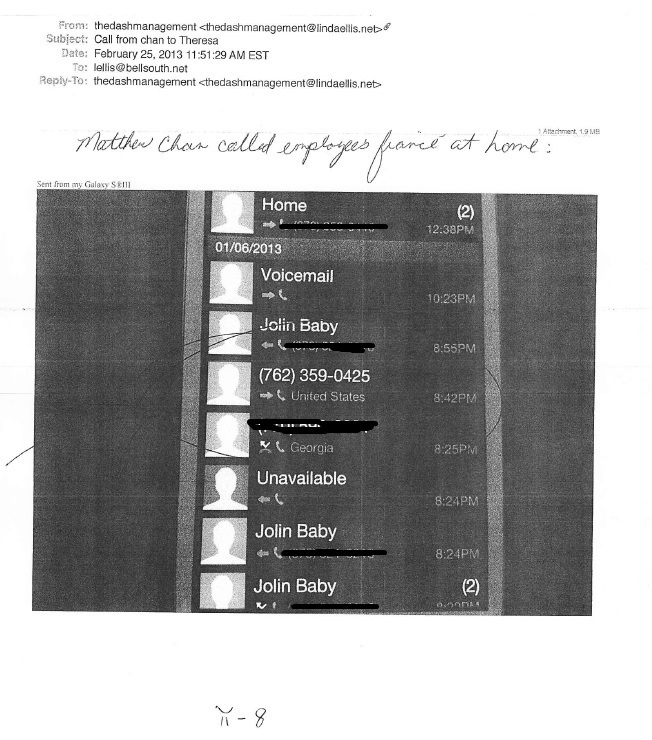 The “employee” that Linda refers to is John W. Jolin. First off, I do not believe that John W. Jolin is an “employee” in the traditional sense. But that is what she testified to in the lower court regarding John. I believe that John W. Jolin is actually an independent contractor for Linda’s business, Linda’s Lyrics. In a colloquial sense, he would be her “employee”. I don’t have any evidence one way or another (only a gut reaction) but being a small business owner myself, most small business owners much prefer to hire independent contractors instead formal employees if at all possible. I believe this is also the case with Linda’s Lyrics. Dealing with formal employees entails much more responsibilities for the business owner such as dealing with payroll taxes and employee benefits. In any case, even if Linda made that “error” in testimony, it could easily be defended as her use of “employee” was not a legal definition but one that was colloquially used. As you can plainly see, I have a good sense of what a colloquialism is. For Linda, it appears to be an abstract concept like the word CONTEXT. CONTEXT appears to be a foreign concept to Linda and that will be her undoing when people shake their head in pity. Pointing out that Linda’s reference to “employee” might simply be a colloquialism is my gift to her as a counter-argument to my own belief of his legal employment status. I bring this up to illustrate the point that I do pay attention to details and I do have a sense of CONTEXT unlike what Linda has shown towards me, April Brown, or ELI, in general. Regarding the issue of whether I actually “called” John’s girlfriend, the answer is a conditional “YES” although I testified on the day of the hearing that I didn’t call her. Now before anyone screams PERJURY, the fact of the matter is at the time I was testifying, I absolutely believed I didn’t “call” her. In fact, I was so caught off-guard by the screenshot provided, I was truly dumb-founded. In my mind, I was desperately trying to figure out how my Google Voice number appeared on John’s girlfriend’s phone when I had no recollection of even having her phone number much less calling her. The trouble I had was that John’s screenshot clearly showed my Google Voice number on her smartphone! Unlike Linda’s other court exhibits, this screenshot didn’t require much context. Either my Google Voice number was there or it wasn’t. If I had believed John made up or forged the screenshot, I would have stated it right then and there and accused him or Linda of creating or fictionalizing the screenshot. However, I couldn’t in good conscience do that because I didn’t believe anyone forged it. I believed John’s screenshot was legitimate and that it displayed my Google Voice number on her smartphone. John even provided a cell phone bill with a detailed log showing my Google Voice phone number and that the call was for one minute. From a legal argument perspective, the case was about me allegedly “stalking” Linda, not “stalking” John’s girlfriend. Bringing up the notion that I might have “scared” John’s girlfriend with a one-minute call with my Google Voice number sounded “stalky” but it was not any proof whatsoever that I “stalked” Linda whatsoever. It was Linda seeking a protective order that day, not John’s girlfriend. Even the judge said as much. As I was saying, I was caught off-guard trying to figure out how my Google Voice number ended up on their cell phone bill and cell phone display. The best theory I had at that moment was that my Google Voice number was spoofed. After all, Linda had earlier claimed that she received a “threatening ELI letter”. If she had actually received a letter that appeared to be from ELI, I would claim it was someone impersonating me or ELI. Likewise, it seemed to me that the best explanation that I could come up with was that someone spoofed my Google Voice number. I cross-examined John and asked why he thought there was only one occurrence of my number and that one occurrence was for only one minute. He stated that he wouldn’t know. However, what I wanted to do with that question was to inform the court that if someone wanted to “stalk” his girlfriend, why only make one random call for one minute? It was a mystery that would not be solved for some time. There was also the nagging technical irritation I had for some time that when I make outgoing calls from my cellphone, my “true” cell phone number is displayed in Caller ID, not my Google Voice number. At that time, I wanted all calls I made to display my Google Voice number but because I didn’t know how to make it happen. I finally learned how to do it in 2014 with my cell phone but in February 2013 when I testified, I didn’t know how it could be done with my cell phone. For several years and to this very day, when I call anyone whether they be friends, business associates, supporters, vendors, or clients, people see my “true” cell phone number on their Caller ID, not my Google Voice number. The only people who see my Google Voice number on their Caller ID nowadays are the few Canadian contacts I have or when I text message anyone. I force my calls through Google Voice when making Canadian calls because calls to Canada are free using Google Voice, not because I want my Google Voice number to show up on their Caller ID. People see my text messages from my Google Voice number because I like that app better for sending text messages than traditional text message apps. The issue of my Google Voice number showing up on John’s girlfriend’s phone bothered me because of the technical issues involved. Because I didn’t know how to force my outgoing calls to display my Google Voice number at that time, It was a huge mystery to me. The court exhibit John provided was not particularly important as this was largely hearsay evidence and it was not direct evidence I “stalked” Linda in any capacity. Nevertheless, I wanted to solve the mystery. By the time of the February 2013 hearing, it had been some time since I had conducted any online research on Linda & John (which largely consisted of Google, Facebook, and county government websites). There were Google and Facebook searches that I did on a couple of family members out of sheer curiosity. I eventually remembered one evening when I was doing a Facebook research on John and he linked to his girlfriend’s page. I clicked to view her Facebook profile. Her Facebook profile was different than most Facebook profiles in that she published her personal phone number and it was visible to anyone who had a Facebook account. What I recall seeing was an icon and a hot-link on her phone number on my Google Chrome browser. 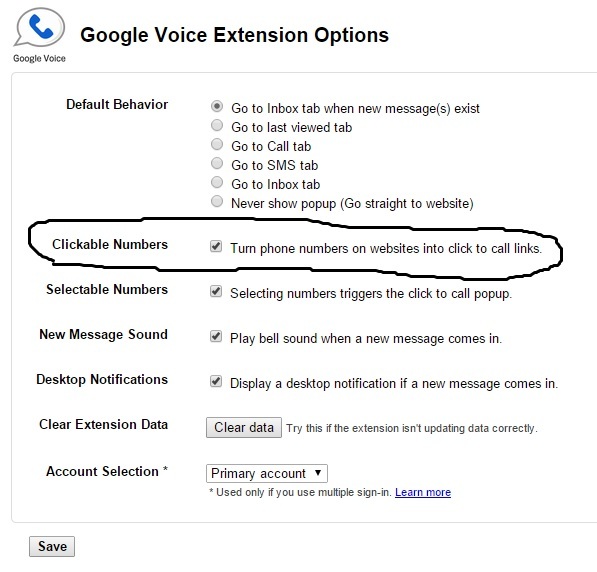 It turns out that Google Chrome browsers have a Google Voice “click-to-call” feature and the ability to make phone numbers into “live clickable links” that will automatically activate Google Voice to making a phone call for you. Using my friend Greg Troy’s business website as an example, this is how his business phone appears in a Firefox browser. Notice how there is no clickable link on his business phone number. And when I view the same exact page with Google Chrome browser, this is what appears. Please notice that his business phone number is now a live clickable link. Even with what I know today, I would not normally assume that clicking someone’s phone number within a Google Chrome browser would automatically activate a Google Voice application on my computer. I would assume that clicking the phone number might take me to another web page. And yet, if you have the Google Voice Chrome extension installed and “clickable numbers” feature enabled, clicking anyone’s phone number on a web page will initiate the Google Voice call using your Google Voice number. The biggest difference I remember from the current set of sample screenshots and what I saw onscreen two years ago is that I remembered an icon next to the live clickable phone number which triggered my curiosity. Given that both Linda, John, and his girlfriend are inclined to think nefarious thoughts about me, they somehow speculated that I saw their Facebook timeline and “secretly plotted” to make a timely “stalky” phone call while he was allegedly out of town. The truth of the matter is that I don’t recall being able to read their Facebook timelines and if I did read it, it was of no particular significance to me. The truth of the matter was there was no nefarious move on my part whatsoever to intentionally call (much less “stalk”) anyone whether it be Linda, John, or his girlfriend. If I had anything to communicate directly to Linda or John, it would be very easy to do. Quite simply, the Google Voice call was a weird, untimely accident stemming from an innocent mouse click not knowing that I would activate the “Click to Call” live-link feature. As most people know, any cell phone connections automatically default to a 1-minute minimum when shown on a cell phone bill. It was likely a 5-second connection when I discovered the mishap and disconnected. This concludes Part 4. Please check back soon for Part 5. It just goes to show you that prisons are full of wrongly convicted people. I doubt ANY lawyer would have figured out what you have about the evidence against you in your own case. It took almost 2 years for you to research this “glitch” or unique feature of Google Voice. Still, the fact is that a one minute voice call from your number with no message or comment or connection to a human should have never been considered stalking in the first place. Using that logic or test, I could accuse Google of stalking me right now. I get at least one or more calls from Google every single day. We could accuse Jolin of stalking every time he calls one of her targets to settle, couldn’t we? This was a stupid case from day one. It should have never gone forward. Period. I have to wonder how many of Judge Jordan’s decisions have ruined people’s lives. Wouldn’t it be something to research that!